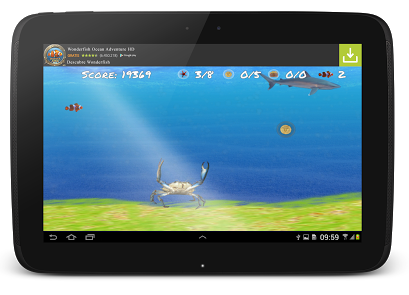 Wonder Fish Free Games HD is a fun and easy to play game developed byZAUSAN. In this Arcade game, you take control of a self-titled ‘wonder’ fish in an attempt to assist him in rescuing his beloved Blackyfinn from the claws of a vague deep sea monster. Now I’m big fan of games set in the ocean (I’m looking at you Hungry Shark Evolution) so it was an absolute joy jumping in and getting this downloaded. If you have a tablet, I recommend installing it on there for maximum enjoyment. The smartphone version is perfectly fine, it’s just a bit more fun with a larger screen. Once you get into the gameplay arena, you will see that there are 20 levels at your disposal, obviously as you complete each level, you gain access to the next. 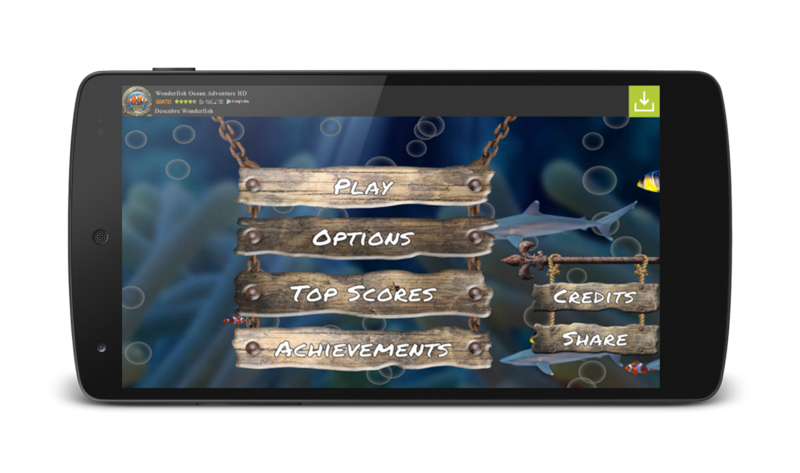 You can also shop for new fish, and special in-play features using credits scored within the game. Going through to the first level will introduce you to the rudimentary narrative that has been created. This is better than no narrative at all but it is definitely aimed at children and young adults (at a stretch). Once you get past this ‘setting of the scene’ you will be able to start! For all intensive purposes, the ‘flappy bird’ style arcade game has been done to death over the years but since the popular revival earlier in 2014, anything that resembles this linear format now feels even more predictable and uninspiring. During the game you have to employ upwards and downwards movement to avoid obstacles such as coral, fish, sharks etc. If you hit any of these you will of course die. Thankfully there are multiple lives per level so if you get it wrong, you will have a reprive. The levels themselves are nice, not too long so that it is too tedious and not too hard that they are near impossible. This allows you to progress through the levels pretty swiftly once you get the hang of it. The real sticking point with this app is the graphics. They are not great, at times I felt a little chuckle as the 2D graphic images of obstacles I had to avoid came up. Overall the aesthetics of the menus, text and gameplay is nothing more than average and it does let down the overall app experience. In short, this app is nothing more than a solid recreation of a familiar arcade style of play. The graphics in particular let it down but I know there are some out there that will not see this as a massive sticking point. Wonder Fish Free Games HD is available on the Google Play store and requires Android versions 2.3 and up.